Blast hordes of reanimated skeletons with holy fire, explore new worlds in a steam-powered zeppelin, match wits with an alien warlord, or invent your own entirely unique world. Unlimited adventure awaits you in a roleplaying system limited only by your imagination with Genesys, a roleplaying game featuring the narrative dice system! 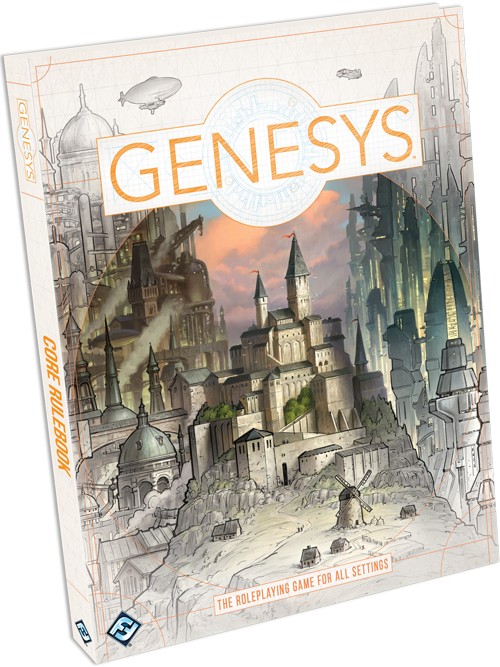 Genesys is a role playing system designed for flexibility and adaptability, specifically tooled to work with any setting imaginable. The Genesys Core Rulebook not only contains an overview of the rules and how the innovative narrative dice system works, but everything a GM and players need to run adventures in five completely different settings. Everything from equipment to adversaries, character abilities to an overview of narrative tropes, all is provided in the core rulebook for Genesys. 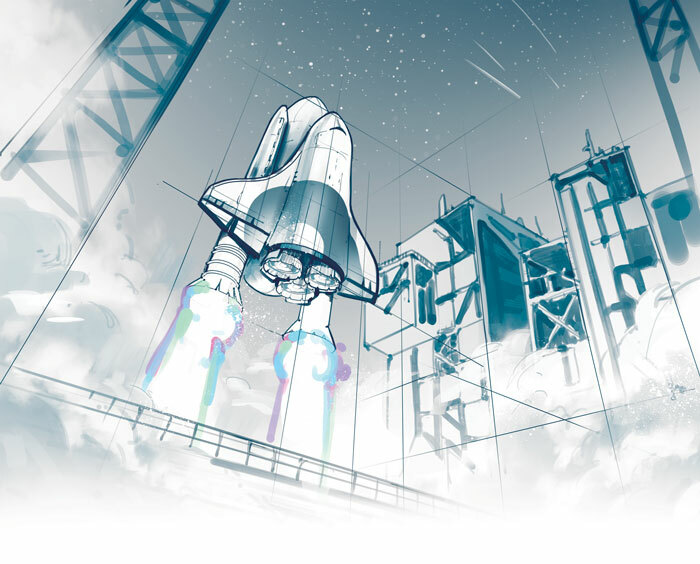 With a system so adaptable and expansive you can explore every popular roleplaying genre, from classic fantasy style campaigns, to modern day detective thrillers, and even to a far off sci-fi future, Genesys doesn’t fit into any one genre of roleplaying, and instead invites players to craft their own stories with unparalleled freedom. The Narrative Dice System provides dramatic results to every challenge. With every skill test, players will roll in a dice pool featuring a variety of different dice. 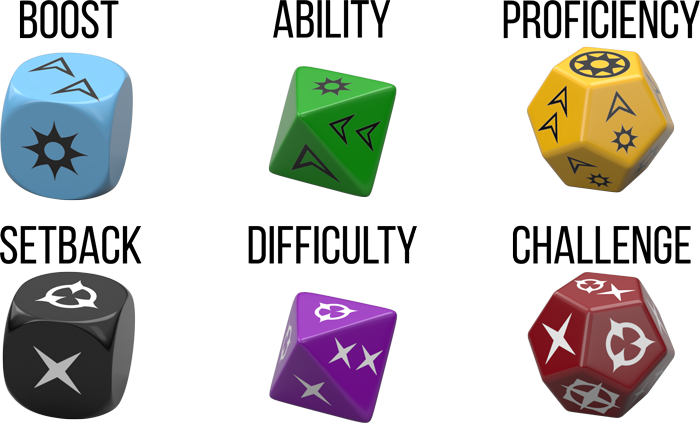 Ability dice come from your character's innate characteristics or skills and provide Success and Advantage symbols. These dice are opposed by Difficulty dice in your pool that represent the difficulty of the task at hand. 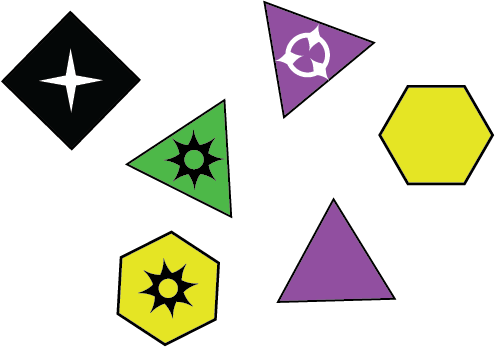 These dice feature Failure and Threat symbols. Rolling more Success symbols than Failure indicates that the action is successful, but the results are far from binary. Advantage symbols provide some kind of positive benefit regardless if the check was successful, and Threat symbols provide some kind of negative effect despite the results of the check. Ability and Difficulty dice can be upgraded to Proficiency and Challenge dice, respectively. These dice include Triumph and Despair symbols, which provide powerful positive and negative side effects. Ability dice are determined by a combination of your character's innate characteristics and trained skills. In Genesys, both of these have a value, the higher of these two values indicates how many Ability dice you roll, the lower number determines how many of those dice are upgraded to Proficiency dice. For example, Kendra is trying to climb down a rocky cliff to escape from a vicious grizzly bear. This check uses Kendra’s Athletics skill and Brawn characteristic together. Kendra has Athletics 2 and Brawn 3. Her Brawn is higher, so the player begins by adding three Ability dice to the pool. Kendra’s Athletics skill is lower, so the player upgrades that number of dice (two) to Proficiency dice. To attempt the climb, Kendra starts out with three dice in her pool, one Ability die and two Proficiency dice. The GM determines the challenge is of average difficulty and adds two Difficulty dice to the pool, as well as a Setback die due to the extreme stress of the situation. In all, Kendra rolls six dice—two Proficiency, one Ability, two Difficulty dice, and a Setback die, and gets the following results. One Success is cancelled out by a Failure, leaving a Success and a Threat. The GM determines that although Kendra has completed the climb (Success) she becomes separated from the rest of her group (Threat). Dice can also be upgraded with story points; at the start of a session, players receive one story point for every player, and the GM receives one story point for their own pool. While these story points have a variety of uses, players can use points in their pool to upgrade an Ability die to a Proficiency die, and the GM can use their points to upgrade a Difficulty die to a Challenge die. Spending a story point as a player gives an additional point to the GM, and vice versa. 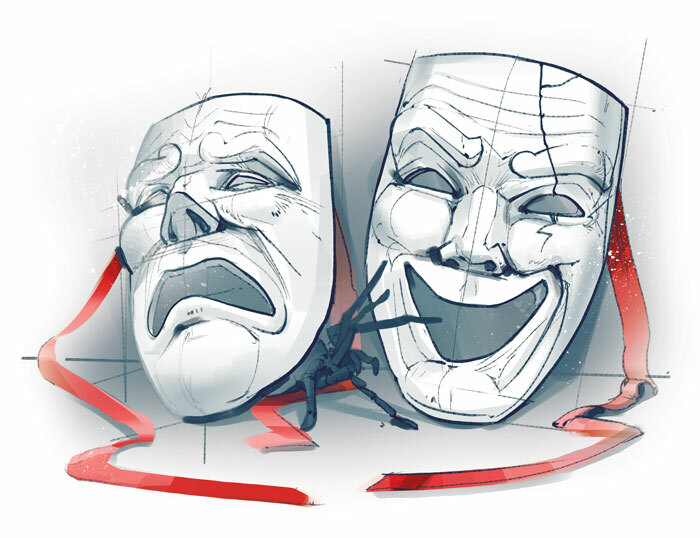 Story points can be used to raise the stakes during dramatic moments, or give players the boost they need to overcome impossible odds. The Narrative Dice System can be used in a variety of different settings, and the Genesys Core Rulebook provides a starting point with five wildly different genres. The Genesys Core Rulebook contains everything you need to run a fantasy adventure. Whether it's a sword and sorcery campaign or a realistic low-magic setting, quests, MacGuffins, and epic showdowns between good and evil await eager adventurers. The Genesys Core Rulebook offers a wide variety of equipment and enemies that often appear in a fantasy setting. The core rulebook even includes unique starting character options for orcs, dwarves, and elves. Although the term steampunk originated in the 1980s, the foundations of the genre go back much further. As is often the case when it comes to defining and categorizing fiction and its genres, opinions differ. But a strong argument can be made that the origins of steampunk lie in what are more commonly considered the earliest science fiction stories. The fantastic science and contraptions shown in the works of Jules Verne, H. G. Wells, and Mary Shelley are based in the technology of the 1800s but go far beyond what was possible at the time. This advance beyond this historical realism is the core of steampunk. A steampunk setting provides the opportunity to explore unique equipment that would seem out of place in other settings. The Genesys Core Rulebook features stats for weapons like the Spring-Fist, a clockwork pair of brass knuckles, and the Rotosword, a steam-powered chainsaw. These weapons are supplemented by daring airship captains and wild scientific concoctions to create an authentic steampunk experience. While the Genesys Core Rulebook offers everything you need to run an adventure in a Weird War setting, the genre truly shines with its unique adversaries. Blend genres with the terrifying Occult Commando, or add a tinge of weird science with the Arcane Scientist, both of which are included in the Genesys Core Rulebook along with plenty of bizarre weapon and armor choices. Perhaps the biggest advantage of a modern day setting is its versatility. 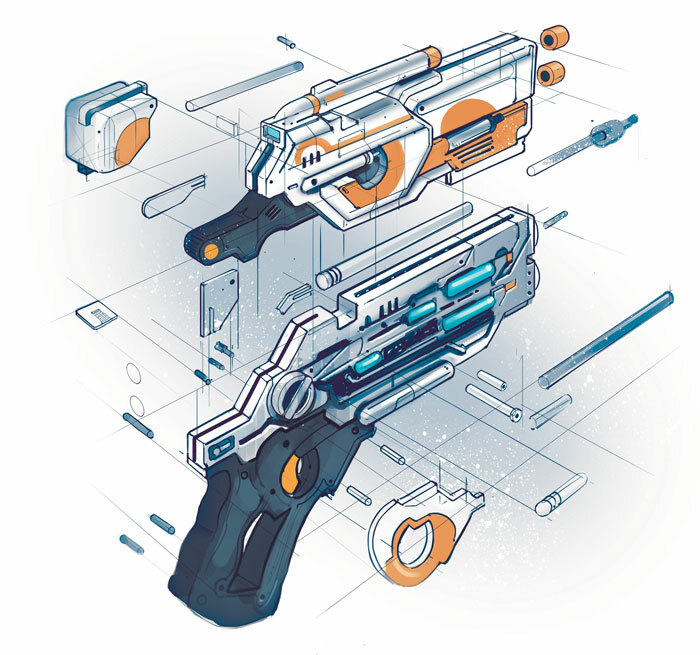 The Genesys Core Rulebook not only provides a full list of modern weapons appropriate for any genre, but a full list of usable tropes uses to ensure game masters strike the exact tone they are looking for in a modern-day adventure. The Genesys Core Rulebook has two chapters dedicated to science fiction, one featuring foes, equipment, and tropes found in more grounded sci-fi, and another focusing on space operas. This breakdown allows you to mix and match concepts to create your very own science fiction playground for players to adventure in. Like the Fantasy setting, the science fiction genre is ripe for unique starting character options. The Genesys Core Rulebook offers stats for everything from clones to exotic space races to populate your science fiction adventures. Take to the skies as a pirate in a steampunk adventure, dive into modern military combat, or explore the unknown galaxy. The adventure begins with Genesys. One book, unlimited adventure.